How 'factory farming' evolved is described in a new book In Meat We Trust: An Unexpected History of Carnivore America by Maureen Ogle. This well researched work, with plenty of endnotes, tells the story of the 'industrialization' of raising, butchering and distributing meat - beef, pork and chicken. In the early years, American meat was plentiful and people could be selective. In a previous posting HERE on pigs 'cleaning' the streets of New York City "...hundreds of calves' heads, large bits and whole joints of meat..." were thrown into the street by butchers. One of the author's premises is that the consumer always demanded cheap and readily available meat, and the farmers and suppliers had to keep constantly changing and improving the process to keep the prices down. Like Henry Ford or Andrew Carnegie, the meat producing and packing industry had strong pioneering individuals, such as Swift, Tyson and later, Harper with Conagra. Gustavus Swift (1839-1903), who started as a butchers apprentice, took advantage of the system of railroads and new refrigerated cars to butcher the beef in Chicago and send it east. During the Depression a feed/seed store owner in Georgia changed small farm chicken growing by organizing family farmers to raise chickens to his feed specifications and he would build a 'vertical integrator' model - where the packers control the producing. The increasingly large numbers of chickens raised and sold in Georgia over ten years - from 400,000 in 1934, 1.6 million in 1939 and 30 million in 1945 - were a result of the changing farming system. The need for large scale production would start the chickens, cows and pigs spending their lives in a building. The author describes in detail how the various stages from colonial to corporate farm took place and stories of some innovative individuals involved, rather than expounding on the living conditions for the animals and other contentious topics. The series of government regulations and studies are recounted, but also the aid to farmers by the USDA and researches done by the land grant colleges in the areas of antibiotics, feed, and genetic changes to make more uniform animals resulting in same-sized meat cuts to suit large scale users - large groceries, institutions and restaurants. Market forces, social factors and government - both aid and restrictions - resulted in the large scale farms we have now. It was a long process, a lot of the early history was new to me, thus I particularly enjoyed the first part of In Meat We Trust. 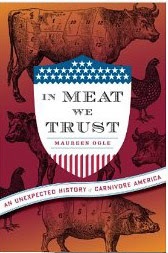 In Meat We Trust, an unexpected history of carnivore America by Maureen Ogle. Boston: Houghton Mifflin Harcourt, 2013.